The horseback riding program at Stone Mountain Adventures combines experienced horses, qualified riding instructors, and excellent facilities to create an atmosphere in which campers can advance their riding skills, expand horsemanship knowledge, and have fun in the barn every day. Beginner riders will focus on horse and barn safety, the fundamentals of horsemanship, and centered seat riding. More advanced riders will improve their riding skills on the flat and over jumps while enjoying individualized instruction. 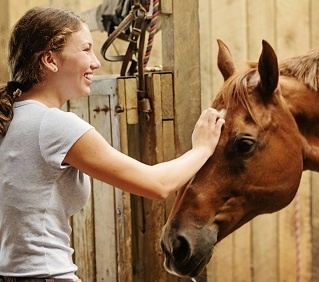 Whether you have always dreamed of riding a horse or ridden your whole life, attending an overnight teen summer camp with such a well-established horseback riding program is a once-in-a-lifetime opportunity! We give campers the choice to ride either English Style or Western Style, which lends lots of flexibility and potential to their skill development. There really is nothing like the joy of sitting atop such a strong and powerful animal, and being completely in control! Once campers are comfortable with the horses in and around the barn, they’ll have the opportunity to go out for a trail ride through the fields and forest - a perfect activity for a hot summer day! 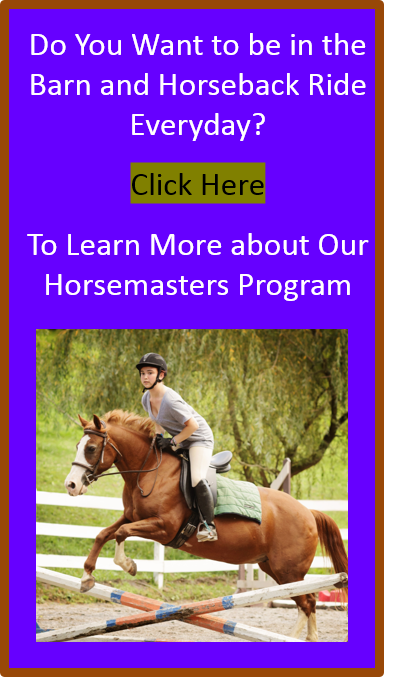 The Stone Mountain Adventures Equestrian Program is run by equestrian professional Pam Hayes-Houldin and her experienced instructors and barn staff. Pam has over 35 years of riding instructing experience and is one of the original founders of Stone Mountain Adventures. 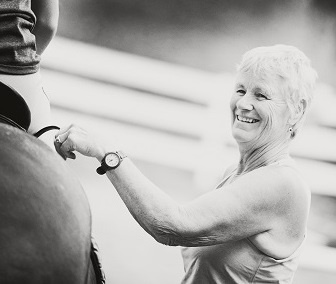 Each summer, Pam and her team look forward to working with campers and improving their confidence, knowledge, and experience around horses as well as their riding skills. She has an effective, time-honed teaching style and knows how to bring out the best in riders and horses alike. All equestrian activities take place on-site at Stone Mountain Adventures. Our 60-acre riding facility, also known as Horsepower Farm, is centered around a beautiful 200-year old barn retrofitted with modern box stalls, a tack room, and an indoor barnyard. 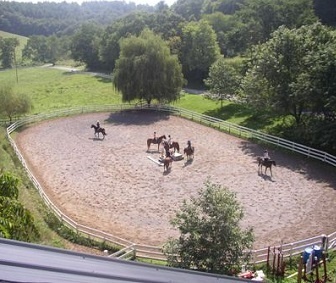 All formal riding lessons take place in our outdoor arena, and we have three additional paddocks for turnout. Along with the historic barn, riding arena, and turnout paddocks, we have acres of winding trails through coniferous forests available for campers and their horses to explore. We also have fields set up with a cross country course for riders interested in eventing. All of the horses that we ride in our summer equestrian program live in our facility year-round. Horsepower Farm is home to a therapeutic riding program for people with disabilities that runs in the spring and fall each year. We work with our horses every day of the year, and we know their personalities, their strengths and weaknesses. Because of this, we are better able to match our campers with the “right horse” in SMA’s horseback riding program. This horseback riding summer camp is designed for riders of all skill levels. Campers eagerly look forward to their time in the barn and grow to love spending time with Pam and the horses. In no time at all, they learn all of the horses’ names, where they live in the barn, and what their favorite treats are. The opportunity to connect with horses in this way is very special, and something that can only be found at a camp like Stone Mountain Adventures!